The BioWIN 2 Touch range of wood pellet boiler are highly efficient, durable and the smallest biomass pellet boilers on the market. Requiring less than 1.5m2 of space, with minimum clearances included, the BioWIN 2 Touch is the only pellet boiler that can fit into small, restricted areas and be installed flush to the wall requiring no service clearances to the rear, left or right of the appliance. Fully equipped with a high quality stainless steel burner, LowDust technology and a unique self- cleaning function, the BioWIN 2 Touch ensures a clean combustion process with minimal maintenance requirements. Total installation flexibility is assured with 3 feeding options. 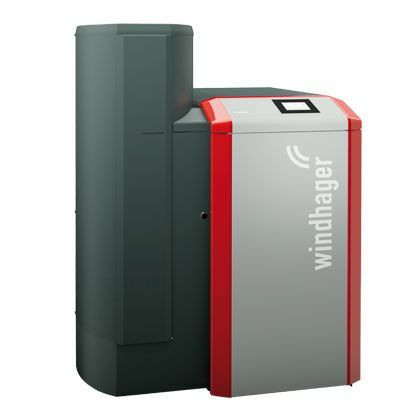 Hand fed appliances are available with integrated 100 or 200kg hoppers or as an auto feed appliance utilising Windhager’s unique suction feed system which can automatically refill the boiler hopper from a bulk pellet store over distances of up to 25 meters between the bulk hopper and boiler. BioWIN 2 Touch features as standard an automatic heat exchanger cleaning function, ash can be simply removed via an ash bin directly below the burner bowl (Klassik and Premium models), or ash can be automatically removed from the boiler and compacted into an easily detachable remote ash bin below the fuel hopper for longer periods of ash removal (Exklusiv model). BioWIN 2 Touch is fitted as standard with an InfoWIN touch screen control, this provides an intuitive interactive control of the boiler and heating system.